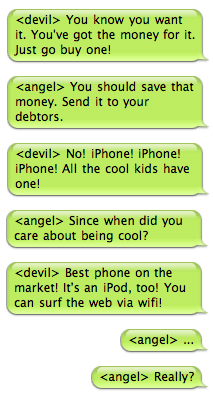 A good friend is trying to decide whether or not to buy an iPhone, and I was attempting to help him reason it out. So sayeth Jeff Harrell, upon the realization that Ratatouille opens nationwide today as well. How do you know you have iPhone fever? When, while watching a show recorded on your TiVo, and fast-forwarding through the commercials, you stop and back up to watch the iPhone commercial you’ve already seen about fifty times, then proceed to fast-forward through the remaining commercials. An art project of galactic proportions, as different artists decorate Darth Vader helmets. Just how hot is that pepper on your plate? Home of Mac Face, a Facebook notification application for Mac OS X.
SF author Charles Stross’s blog. Seen in Business 2.0, all-natural chocolate candy bar, with only 130-150 calories per bar. And they have dark chocolate, too! I don’t think I’ll ever beat Brian Fortner’s grocery shopping record–I’m picky with the produce–but I like his fatherhood rules. A spill of liquid, that is, not a spill as in a fall. Sony’s 9-ounce, half-inch thick, e-book reader.